Provides data for managing shellfish harvest: Shellfish monitoring provides data necessary to manage shellfish growing areas, permit harvesting, and facilitate the interstate sale of shellfish. Protects public health: Monitoring shellfish growing areas protects public health by ensuring shellfish are harvested from areas with acceptable water quality. Demonstrates efficacy of infrastructure improvements: Tracking bacterial contamination levels in shellfish growing areas helps determine if infrastructure improvements meant to improve water quality, particularly at wastewater treatment facilities, are working as designed. 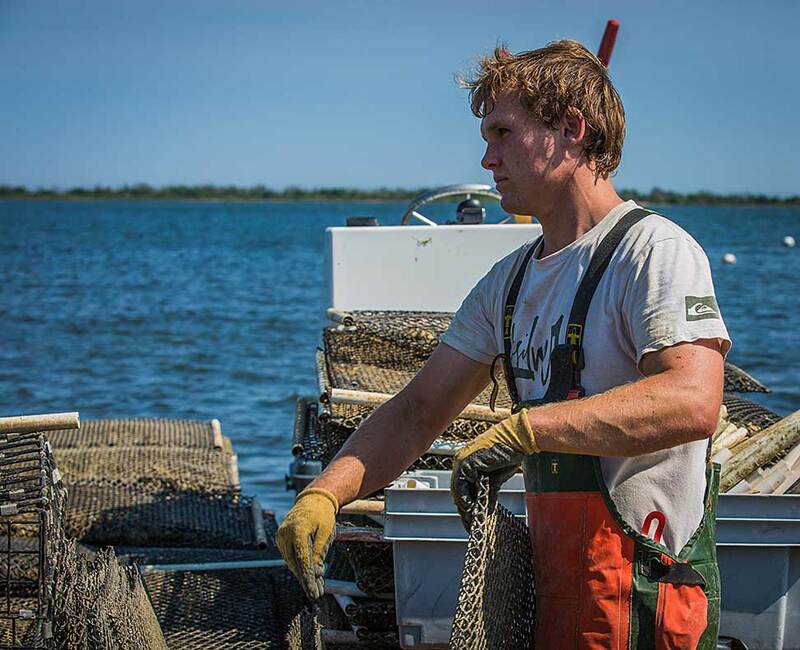 Oyster aquaculture is making a comeback in Rhode Island waters, particularly in the coastal salt ponds. Photo courtesy of Watershed Counts. There may be nothing more quintessentially Rhode Island than its shellfish: quahogs, oysters, steamers, littlenecks, mussels, and more. Rhode Islanders have been harvesting shellfish since before Roger Williams founded Providence Plantations in 1636, though the size of the harvest and the target species have changed over time. Bay scallops were a major economic resource in the late 1800s, but the decline of eelgrass—the scallops’ preferred habitat—has all but eliminated that industry. Oyster farming was a major industry in the 1800s that declined in the early 1900s, and is now making a comeback. The RI Departments of Environmental Management (RIDEM) and Health (RIDOH) are charged with oversight of the growing and harvesting of shellfish, which includes designating which areas are appropriate for wild harvest and shellfish aquaculture. Sources of bacterial contamination include leaking or improperly functioning wastewater collection and treatment facilities (WWTF), combined sewer overflow outfalls and septic systems, and waste from domestic animals, waterfowl, and wildlife. Through these sources, bacteria can enter the bay and coastal waters directly, or by surface runoff, stormwater drainage pipes, and even groundwater seeps. To protect public health, RIDEM follows guidelines established by the National Shellfish Sanitation Program to designate areas having water quality suitable for harvesting wild and farm-raised shellfish. Pollution-based closures may be “permanent,” “seasonal” (most common in and around marinas and mooring fields), or “conditional” (related to wet weather conditions or WWTF bypasses). These closures typically do not prohibit the harvest of whelks and snails because they are not filter-feeding bivalves like oysters, mussels, and clams. Shellfish are a large part of Rhode Island life. Aquaculture—primarily of oysters—is a growing commercial industry that contributes to the economy. Wild harvest of shellfish, including both commercial and recreational (which is a right for Rhode Island residents and licensed for those coming in from out-of-state), drives the economy directly and through tourism. Rhode Island aquaculture was worth over $5.5 million. Aquaculture farms employed 171 people on 240 acres. Commercial harvest of quahogs was worth $5.8 million. Commercial harvest of sea scallops was worth $7.7 million. Commercial harvest of whelks and snails was worth $1.2 million. Twenty-eight million shellfish were harvested from Narragansett Bay and Rhode Island coastal waters. In addition to bacterial contamination, toxins produced by marine phytoplankton can make shellfish a health risk for humans. The vast majority of marine phytoplankton—also known as microscopic algae—are beneficial and form the base of the marine food web. When these phytoplankton rapidly increase in response to high levels of nutrients, warm water temperatures, and other environmental conditions, then “blooms” can occur. Many species of phytoplankton do not pose risks related to shellfish, even during blooms, but some species produce biotoxins. These are referred to as Harmful Algal Blooms or HABs. The biotoxins that are produced by the phytoplankton bloom can accumulate in shellfish tissue, just as bacteria can, and may cause illness in humans who consume contaminated shellfish. To protect public health and ensure the safety of shellfish in the market, RIDEM works with RIDOH, the University of Rhode Island, and Rhode Island shellfishers and aquaculturists to employ a strict protocol for the sampling of water and shellfish meat to detect potentially harmful phytoplankton and biotoxins. Monitoring allows managers to evaluate whether it is safe for people to eat oysters harvested from coastal areas, and informs managers’ decisions on when to close shellfishing areas when conditions pose risks to human health. Adherence to this protocol stops contaminated shellfish from entering the market and prevents illness in people who consume shellfish, which in turn protects the reputation of Rhode Island’s shellfish and keeps visitors coming back for more local quahogs, clams, mussels, and oysters. Approved: Harvesting allowed. These areas might be closed temporarily based on bacteria or toxin monitoring results. Conditionally approved: Harvesting allowed except under certain conditions, such as rainfall, wastewater treatment plant by-passes or on a seasonal schedule. For example, a conditionally approved area might be closed for shellfishing for seven days after a rainfall event of over 1.5 inches, even if there are no monitoring results indicating an elevated risk. Clamming is a popular recreational activity. Photo courtesy of Rhode Island Sea Grant.